Showing 1 - 20 of 32 results. 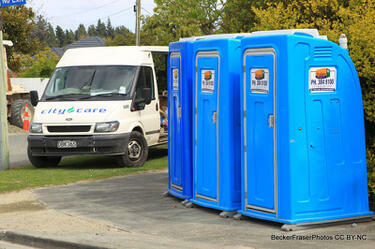 A photograph of portable toilets in Burwood. Many hundreds of portable toilets have been provided to members of the public in areas where the sewerage system has failed and will require many months of major earthworks to rectify. 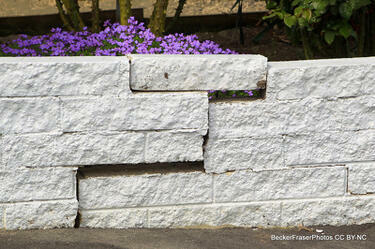 Misplaced bricks on a wall outside a damaged house. The house behind appeared largely undamaged to the photographer, however the owner said "This is nothing, inside the house is a disaster". 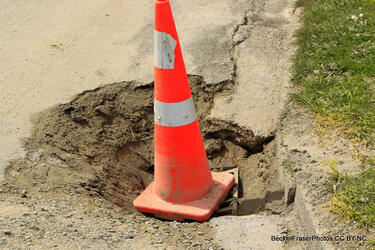 A crack in the footpath in Avonside with cones around it to warn pedestrians and cyclists. 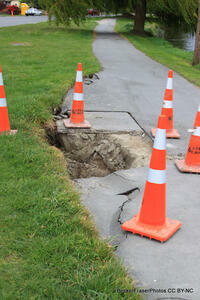 Repairs of sewerage system underway in Avonside. A damaged road island on Avonside Drive. Paving stones have been removed and stacked on the island. A road cone sits at the end. 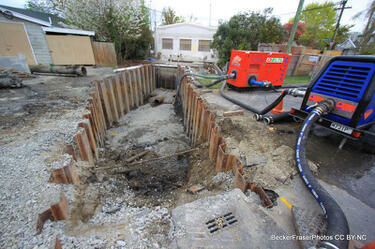 Extensive repairs being made to the sewerage infrastructure on Avonside Drive. 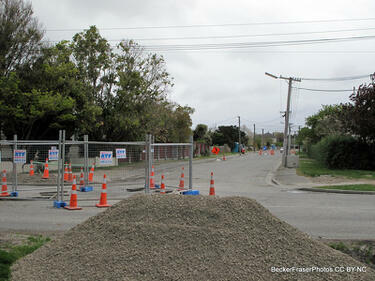 The driveway of a house on Avonside Drive. 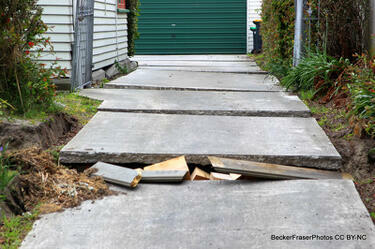 One of the concrete slabs has lifted and the owner has tried to fill the gap with blocks of wood. Unfortunately, these have come loose and are sticking out of the hole. 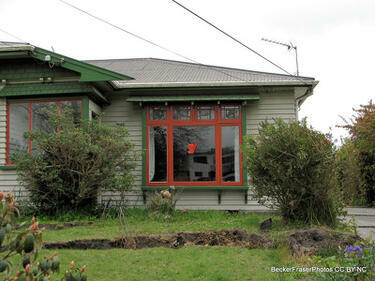 A red-stickered house in Avonside. This means the house is unsafe to enter. A crack can be seen running through the lawn. 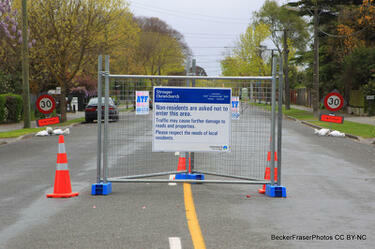 A sign on Morris Street off Avonside Drive clipped to wire fencing on the road. The sign reads "Non-residents are asked not to enter this area. Traffic may cause further damage to roads and properties. Please respect the needs of local residents". 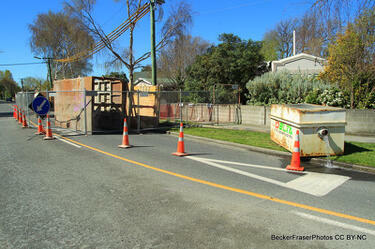 Underground infrastructure being repaired on Avonside Drive. 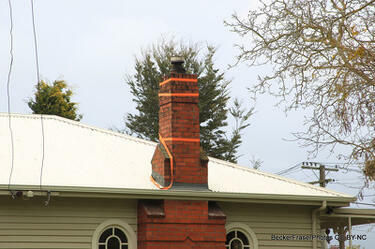 A braced brick chimney on a house in Avonside. 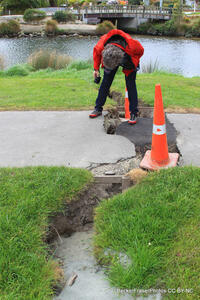 A woman inspecting a crack in the footpath in Avonside. Cones on either side warn pedestrians and cyclists of the uneven surface. Avonside Drive, looking up Rodson Avenue. A pile of gravel can be seen, as well as road cones, Port-a-loos and fencing. 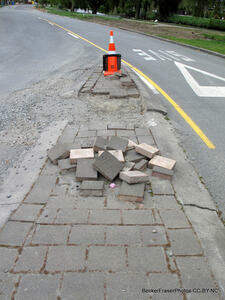 A photograph of road damage in Queensbury Street. 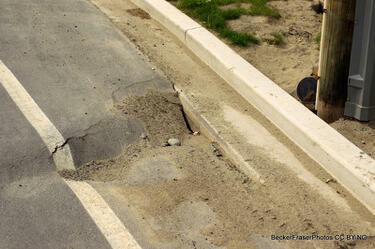 The photographer says, "Many of the road disturbances are along the curb side requiring fill to level them". Road damage between St Paul's School and Gayhurst Road bridge. The road has slumped near the curb, probably due to liquefaction. 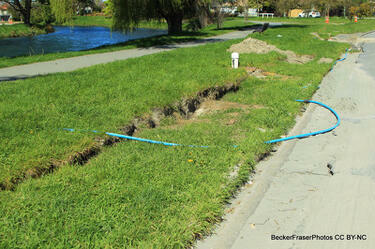 A crack next to the Avon River caused by the ground slumping after the 4 September earthquake. A blue pipe has been laid over the crack. 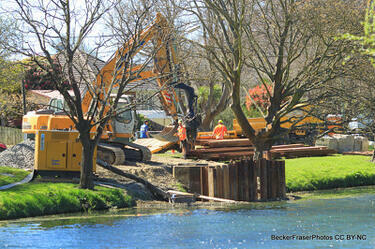 Many kilometres of these temporary water pipes have been run overground in Avonside to supply houses with water. 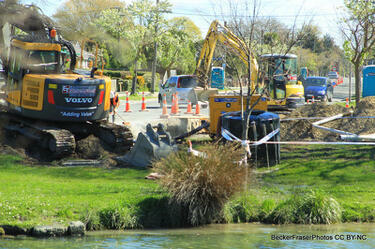 The fixing of storm water drains on River Road in Avonside. 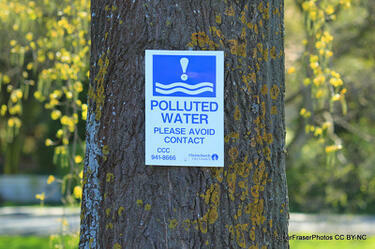 One of many notices along Christchurch waterways, reading "Polluted water, please avoid contact, Christchurch City Council". 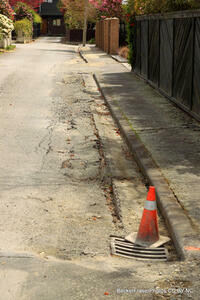 A slumped drain in Avonside with a road cone on top to warn road users. 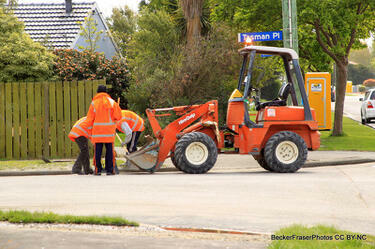 Three men digging silt out of storm water drains in Burwood.